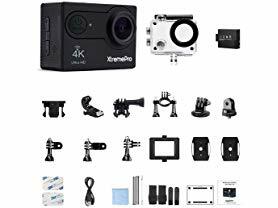 Today only this XtremePro 4K Ultra HD Sports Camera Bundle is just $39.99 (Reg. $349.99)! 4K ULTRA HD - Take incredible photos in ultra HD which has 4 times the resolution of traditional HD cameras. You can also take 4k video at 24fps or use the incredibly smooth 1080p at 30fps for faster paced action. No more looking to your XtremePro to start and stop recordings or snap photos. You have full control of your XtremePro right from your wrist, WIFI &amp; HDMI: Built in Wifi for wireless connectivity with all your smart devices. Connect to your iOS or Android devices directly. You can see a live feed of your XtremePro directly on your smart device. HDMI port also built in for direct conection to any port.